The AIP-CCT programme is a post-discharge, nurse-led home visit service provided by a multidisciplinary team, comprising, nurses, doctors, therapists, pharmacists, medical social workers and healthcare assistants, to support patients in addressing their clinical, psychosocial and home environmental needs. The aim is to support patients and their caregivers so that they can manage well at home and in the community. 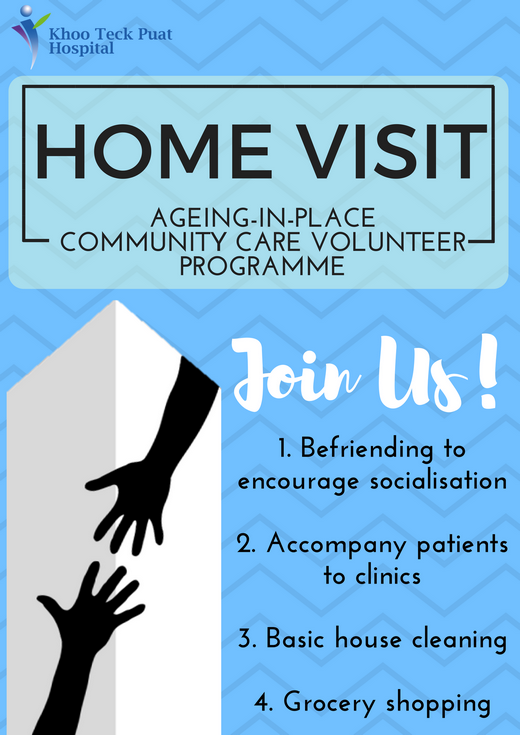 Volunteers play a part in promoting the health and well-being of the patients in the AIP-CCT programme by visiting them at their homes and carrying out an array of tasks to support them. Once there is any area of concern, they would flag them to the nurses in-charge so that appropriate actions can be taken. This could help to prevent the patients from being readmitted to the hospital again. Look out for issues that the clients might be facing, including medical, social and home environment, and ensure prompt feedback to AIP-CCT staff. – Seniors aged 50 and above as the team gear towards encouraging active ageing and to promote more suitable volunteer-client match. – Empathetic and caring individual who enjoys befriending older adults and possesses good communication and listening skills. – Comfortable to travel out in the community and carry out home visits. – To commit at least 6 months. – Preferably to be available on a weekday morning/afternoon for introductory joint-home visit(s) with the nurses. Up to volunteers’ convenient day/timing for subsequent visits.